Adrienne Trimble is the President and CEO of the National Minority Supplier Development Council. 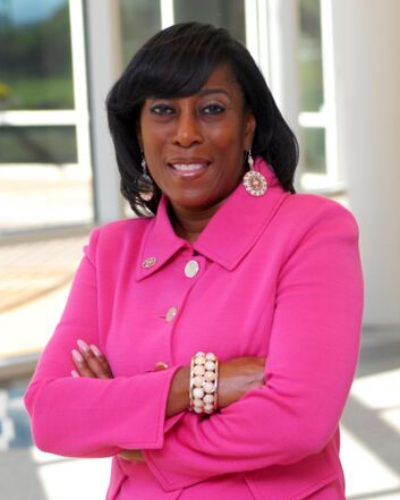 Prior to being named to her new position in August 2018, she served as General Manager, Diversity and Inclusion, for Toyota Motor North America, where she led the company’s Supplier Diversity initiative from 2005 to 2012. National MBE Input Committee Chair and President & CEO, TechSoft Systems, Inc.
Clifford A. Bailey chairs the National MBE Input Committee, a standing committee of the NMSDC board of directors and the leadership body that represents the interests of the organization’s 12,000 MBEs. He has also been a member of NMSDC’s board of directors since 2015. When he is not advocating for small businesses, Clifford runs TechSoft Systems, Inc., a Cincinnati-based IT Support Services Provider specializing in network management and monitoring, cybersecurity and outsourcing. Laketa Henderson has been with the U.S. SBA for seven years. Championing small business from Washington, DC, to Alabama to Texas, she’s committed to providing resources to help facilitate their development and growth in the 8(a) Business Development Program. Prior to the SBA, she worked for more than 20 years in the automotive industry with General Motors, Toyota and Hyundai. Bonnie Nijst serves on the leadership team of the National MBE Input Committee and is the 2018 Opportunity Accelerator Chair. As President and CEO of ZEESMAN, she leads a branding and marketing agency with core competencies in messaging and strategy-driven design. The company provides project-based branding and marketing solutions for large corporations and government agencies, as well as scalable subscription marketing services to small and diverse businesses. Nisha Sharma started her career after law school at a small business in New York. There she became the Director of Government Services and developed relationships with prime contractors and government agencies. She went on to manage MetLife’s federal government contracts before she moved to Verizon, where she supports teams in marketing and IoT and lends her expertise in government business to Verizon’s wireline services. As Chief Happiness Officer at ThinqShift, Vicki Shillington is at the heart — and exudes the heart — of a company whose mission is to craft adaptable leaders. She has over 20 years of experience providing executive coaching and organization transformation leadership, driving productivity improvements by caring deeply about engaged employees. David Kadio-Morokro has more than 17 years of experience providing advisory services to EY’s largest financial services clients. In his current role as the Innovation deputy leader for Financial Services, he helps EY clients develop and industrialize innovation strategies to realize the opportunities offered by digitization and emerging technologies. In his previous role as US risk technology leader, he helped clients implement risk, capital and regulatory technology solutions and has led large global engagements across the technology system life cycle.